Recreational marijuana sales became legal in Nevada on July 1, 2017. In the year that's passed, cash has flowed, businesses have grown and no major controversies have surfaced. A lack of drama during the first year of recreational sales is the biggest victory for the local industry, said Jim Lamb, vice president of the Las Vegas Medical Marijuana Association. In July 2017, eight months after voters passed a ballot measure by 9 percentage points, Nevada joined Colorado, Washington, Oregon, Alaska and the District of Columbia as places where marijuana can be legally purchased without a doctor's approval. "I think the most impressive thing is how little change there's been," said state Sen. Tick Segerblom, D-Las Vegas, who helped usher in legalization. "There's been virtually no notoriety, no issues. It's amazingly smooth." Segerblom was the driving force behind bringing medical marijuana stores to Nevada back in 2013. Voters had legalized cannabis for medical purposes in 2000, but the state had never set up a regulated structure for any sort of sales until the 2013 legislative session. So for Segerblom, who has become a bit of a cannabis celebrity thanks to his unabashed support for and business connections to marijuana, waiting to see that first month of sales data was nerve-wracking. "It's like elections. Everyone tells you you're doing great, but at the end of the day the taxes are the hard, cold facts," Segerblom said. The projections proved to be low, with recreational marijuana sales eclipsing $27 million in the first month. The state Department of Taxation projected that in the first year dispensaries would sell $265 million worth of retail marijuana and generate roughly $50 million in tax revenue. Through the first 10 months, the most recent available data, Nevada dispensaries surpassed all ANNUAL projections. In ten months Nevada has sold north of $340 million and brought in over $55 million in tax revenues. "It has gotten off the ground quicker than what we thought," said Bill Anderson, executive director of the tax department. The state has increased its staff of regulators and administrators in order to keep up with the industry. Nevada's recreational marijuana industry survived confusion in the White House over legalization. Attorney General Jeff Sessions made moves in support of federal intervention in marijuana businesses, but President Donald Trump has supported legislation to protect businesses OK'd by states. In the past year, recreational marijuana saw small signs of a possible future acceptance by gaming. Regulators approved a licensee seeking building space from a businessman who rents to a marijuana company. In May, Caesars ended marijuana drug screening for job candidates. 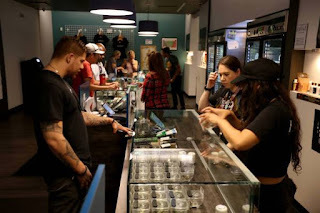 A softening by regulators included 24-hour stores, the city of Las Vegas' flirtation with consumption of marijuana at the places where it's purchased and the state's approval of an extra $1.3 million for taxation department staff and technology to regulate the industry. "Everybody could start breathing again around January," Lamb said. "Everybody's been treading water. We're now seeing businesses recoup their money and attitudes change." But Clark County regulators have developed a reputation as tough on the industry. The county has banned ads at the airport and issued warnings for buses that allow on-board consumption and ads that advocate consumption during yoga activity. For Exhale Nevada CEO Pete Findley, the legalization of recreational marijuana has meant double the employee count to about 65, more products in his store, plans to remodel his store and scouting for additional locations. His customer base has become a mix of locals and tourists, patients and people who just want to get high, Findley said. Challenges that will stay with him in marijuana's second year — and more years, possibly — are high taxes keeping the product too expensive for some consumers and the continued cost of maintaining a license and following regulations. But regulations do come with a benefit, he said. "That's the value of buying at a dispensary. You get a pristine product," he said. "We need the black market and gray market to become as muted as possible." Findley has consulted with regulators and businesspeople in other states interested in the possibility of recreational marijuana where they are located. He said he tells them that even once sales explode, don't forget the patient. "Businesses get excited at adult use," he said. "But you can't forget about the real reason you got into this." 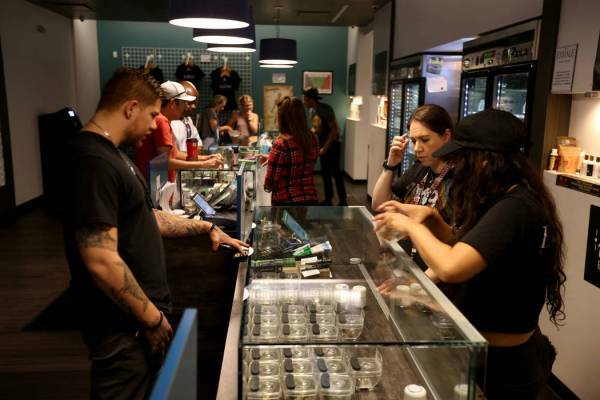 From a national perspective, Nevada had a more successful first-year of recreational sales compared with other states, said Chris Lindsey, legislative analyst for the Marijuana Policy Project, an advocacy group based in Washington, D.C. The future for marijuana in Nevada will include new business models, like home delivery and food and drink sales on site, Lindsey said. But Nevada will have appeal to outsiders as it continues to make usage easier in a tourist-heavy state. And that's one of the next steps Segerblom hopes Southern Nevada governments will soon be willing to take. All forms of public marijuana use remain prohibited in Nevada, and gaming resorts ban cannabis use at the guidance of state gaming regulators, who are wary of interfering with federal laws. But Segerblom said that's unfair to the tourists. "If we're really going to advertise and bring people from around the world to raise our sales, we have to have places where (resorts) can say 'Go over there and use it,' " Segerblom said. Lamb, the vice president with the Las Vegas medical marijuana group, said the state benefited from adopting more stringent lab testing protocols to include tests for mold and pesticides as opposed to just levels of the marijuana component that causes the high. He said the state needs to better define impairment for people who smoke and drive days later, and whether those drivers should be held to the same testing rules as people who drink and drive. Multiple media reports show Las Vegas Metropolitan Police Capt. Todd Raybuck has spoken in New Jersey at least twice against the state legalizing recreational marijuana. "The seizure of illegal marijuana in 2017, after we legalized it there for retail sales, increased 47 percent over 2016, Raybuck told a local PBS station after a March meeting by New Jersey's Assembly Oversight, Reform and Federal Relations Committee. "The illegal market is flourishing." Kevin Sabet, co-founder of Alexandria, Virginia-based Smart Approaches to Marijuana, said an analysis by his group shows more consumption among teenagers since Nevada legalized recreational sales. Sabet said he wants the state to better collect and analyze the effects of legalization on crime, impaired driving, the black market and other facets of life. "One year is simply not enough time to truly grasp the damaging effects legalization has on a state," Sabet said. "It will take decades for a full assessment." Review-Journal staff writers Rio Lacanlale and Michael Shoro contributed to this report. 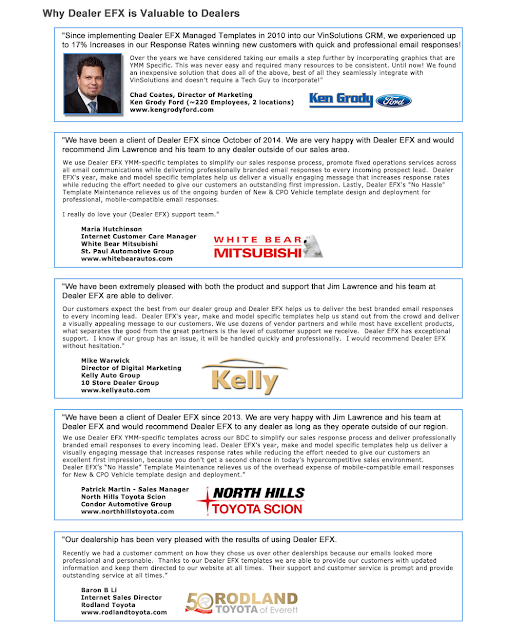 Contact Wade Tyler Millward at 702-383-4602 or by email: wmillward@reviewjournal.com. Contact Colton Lochhead at clochhead@reviewjournal.com or by phone at 702-383-4638.